We offer our client an excellent quality range of GNSS Network, which are manufactured from high grade quality raw materials at vendor's end. These GNSS Network can be customized as per our precious customers specifications. 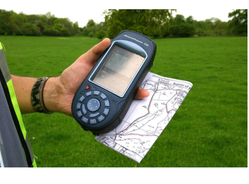 o retain our goodwill in clients' consideration, we trade and supply a quality approved Handheld GPS Device. Our offered device is precisely manufactured at vendors’ end employing advanced technology and quality tested components. Time synchronization creates a platform for an entire system comprising the wide range of products to operate in synchronous with time. Besides, we deliver this device from our end after testing it against different parameters. Our valuable clients can avail this device from us in various designs at industry leading prices.